Recently we had a message about humanity. Today’s message is a perfect tag-a-long. It is about the perhaps the greatest experiment in humanity. It is about the birth of a nation with the idea that everyone…absolutely everyone, is born with the unalienable rights of life, liberty and the pursuit of happiness. Most of us can not imagine that there could ever be anything else. Of course, this is exactly as it should be. But before this nation was created under the Declaration of Independence, it was but a dream. And even then it was a foreign, radical idea for many living here. Many could not even grasp how such a nation could work. The in fighting we see each day within this nation is not unique. Indeed, our forefathers fought each other until they compromised and hammered out The Declaration of Independence. We are reminded of this today because while our forefathers disagreed, they kept talking, arguing with each other. They did not back down and refuse to participate in the process. They kept at it because their hearts knew this nation and its promise was worth fighting for. This nation’s promise and care was passed down through the generations from those first great patriots. Many great Americans have fought and bled for this great nation and those unalienable rights upon which she was created. We are asked today are we a patriot? Are we willing to pick up the responsibilities of citizenship passed down to us? Are we willing to listen to our fellow patriots, compromise and work on solutions? Luke 12:48 in the King James Version. 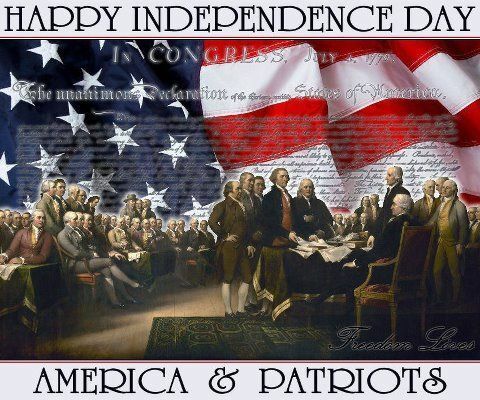 -Celebrate the birth of this nation and the great experiment. -We flew Spirit. Yes, I know they nickel and dime you to death to the point you really could fly another airline for cheaper. But the hours and the fact that this was a straight through flight made it attractive. What made us laugh was their uniforms. I swear their blouses and shirts look like bowling shirts. -I had great help with getting Bruce and all of our bags through to renting a car. -Ahhh, arrived safe and sound.